This route begins at the square before the railway station (1 Plac Dworcowy), near the bus station. Due to the implementation of the Central Industrial Region project, the modernization of the town of Rzeszów gained momentum, also through substantial participation of private entrepreneurs and their capital. The new bright outlook for the future attracted to Rzeszów numerous businessmen from all over Poland, who were anxious to invest their money in the construction business catering for the needs of the housing industry. 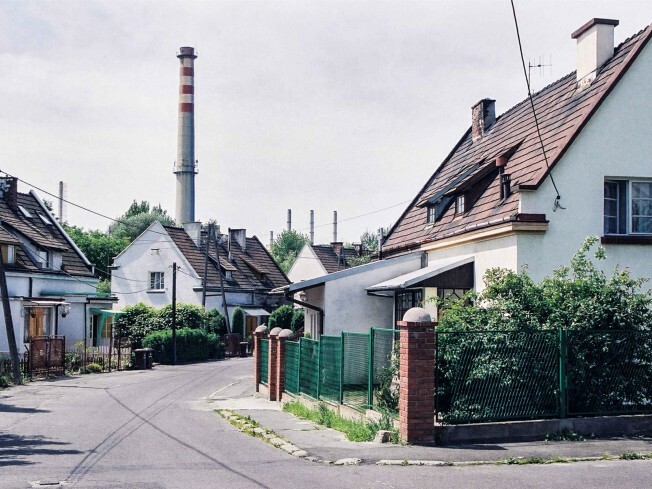 In consequence, our Rzeszów route features not only industrial plants, working-class housing estates and public utility buildings, but also modern tenement houses – financed by local, as well as immigrant investors – intended to alleviate the scarcity of accommodation which marked the dynamic growth of the town. On foot – total walking time: 150 min. By bike – total riding time: 54 min. Due to the long walking time, it is recommended that you should rent a bike or use public bus transport. The first item on the map is the former Rzeszów Hotel at 10 Asnyka street. The house was designed by Zygmunt Tarasin, an architect in Warszawa, for Baron Stefan de Ropp of Poznań. The baron was a comprehensively educated man, who held the position of the director of the Poznań International Fair from 1926. Realizing how fast the economic growth of Rzeszów was, he made a decision to invest his capital in such a promising town. Before World War II, the Modernist style hotel built for him was an epitome of the big-city luxury and comfort. Located in the vicinity of the railway station, it was a showpiece for the people of Rzeszów and the hotel guests alike – and a compelling invitation to visit the growing town. The former hotel at 10 Asnyka street is a valuable example of the pre-war Functionalist architecture, which bears witness to how Rzeszów was transformed into a promising centre of the aviation industry. The silhouette of the building makes a direct reference to the then fashionable trends reminiscent of ship architecture. The building has retained its original unchanged contour, with its characteristic divisions of the window openings. Some elements of the equipment and elevation décor have also survived, such as noble clinker facing, historic radiators, stairwell balustrades, flooring or door woodwork. Moving on towards the Old Market Square, at the crossroads of Asnyka and Sobieskiego streets (1 Asnyka street), another example of private enterprise may be seen – the tenement house built, in the years 1937– 1938, by Rzeszów’s well-known entrepreneur Ignacy Kraus. It was intended for the management of the PZL Aircraft Engine Plant No.2 in Rzeszów. The house was designed by civil engineer technician Jerzy Mackiewicz and architect Karol Holzer. Its Modernist design catches the eye with its imposing dynamic contour, rounded corners, recessed loggias (viewed from Jana III Sobieskiego street) and a characteristic triangular arrangement of the balconies (in Asnyka street). 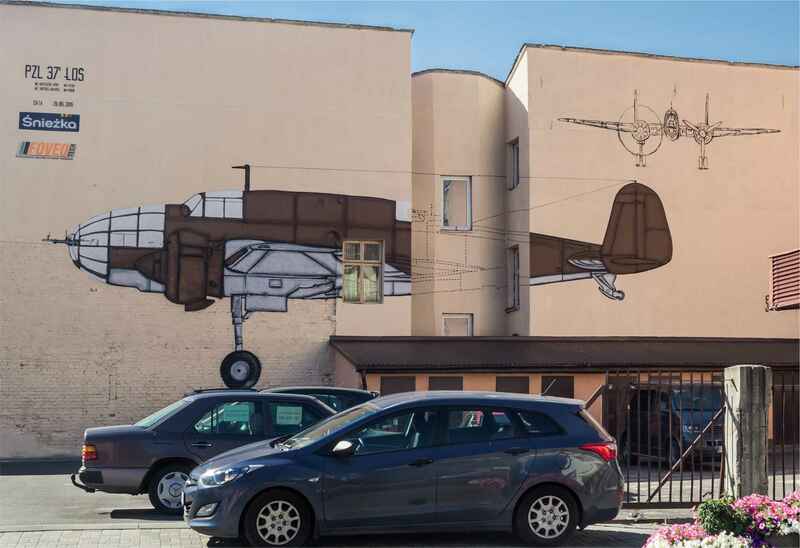 Opposite that house (viewed from Jana III Sobieskiego street), a mural with the ‘Elk’ bomber embellishes one of the houses in Grunwaldzka street. It is a 2:1 painting of the PZL.37 ‘Elk’ aircraft, manufactured in the plants related to the Central Industrial Region. The engine components for that famous Polish bomber were manufactured in the PZL Aircraft Engine Plant No.2 in Rzeszów. 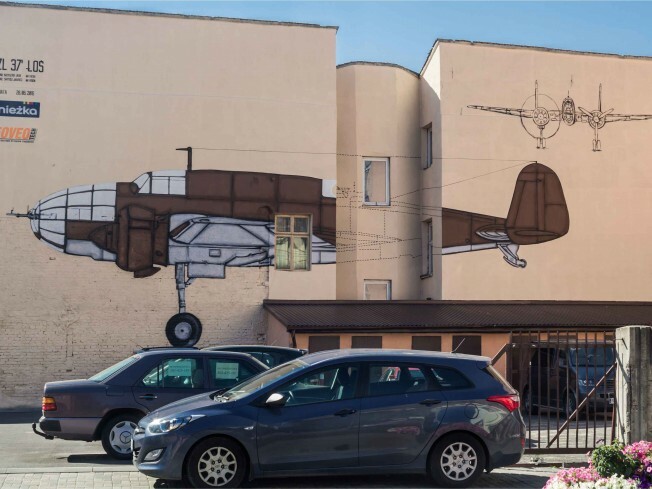 The mural was painted in 2016, at the initiative of the Śnieżka Paint and Varnishes Plant, in co-operation with the Committee for Municipal Area Revitalization and Spatial Aesthetics appointed by the Mayor of Rzeszów. We move on from Jana III Sobieskiego street to 6 Grunwaldzka street, where another tenement house may be found. It was built in the years 1937–1938, for the employees of the H. Cegielski Machine Tool Plant. The investor was the I. Schaitter and Co. trading company, led by Michał Gottman, who took advantage of the loan made available by the H. Cegielski plant. Józef Wetzstein, an architect in Cracow, designed a house of an austere, Minimalist contour, enlivened only by the regular rhythm of window openings. Originally, the house had a tall ground floor, which housed the company’s department store, with two further storeys with tenement flats. After World War II, the house was raised by another storey. Now, we turn into the nearby Matejki street, cross the church square (Plac Farny) and then head for 1 Moniuszki street, where a Post Office building is located. The permit for constructing a post office on church-owned land was issued by the municipal council of Rzeszów in reply to the residents’ growing need for postal services. The design was made by Stanisław Odyniec-Dobrowolski, an architect in Lviv. According to the documents, Tadeusz Mulicki, the main municipal architect, imposed no restrictions on the shape of the building due to the lack of a current local land development plan. The building consists of two main sections which merge with each other – located longitudinally, parallel to the course of the street – and the lower extensions added from the west. The western wing used to house a modern telephone exchange, as well as a gateway leading from Moniuszki street to the inner courtyard. Inspired by the curved line of the street, the architect applied such eye-catching motifs as the overhung corner of the house, with a rectangular supporting pillar. Near the thus obtained arcade, he introduced a round-cornered extension, running parallel to the front elevation. The most expressive element of the building has remained the avant-corps in the highest section of the building, in the east. Its elevation was an undecorated plain wall. That was the dominant part of the building, to which the long main section was subordinated, shaped by the longitudinal rhythm of its rectangular windows. According to the original design, a Modernist clock was to crown that wall, which was prevented by the outbreak of World War II. The base course of the building was given a stone facing. The construction was supervised by Mr. Posatycki, a civil engineer. The work on the building continued during the Nazi German occupation. 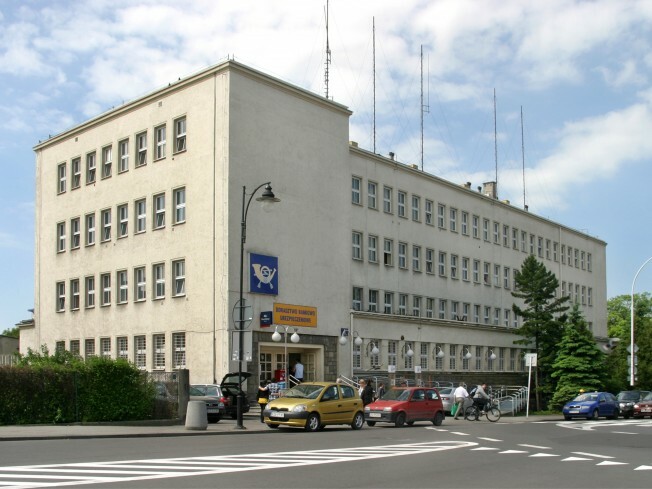 This building is one of the most impressive examples of Modernism in Rzeszów. Today, it still houses a post office. Another item on the Route is the house at 12 Jagiellońska street, which can be accessed from Zygmuntowska street. It was built in the years 1937–1938, according to the design by the above-mentioned Mackiewicz and Holzer team. Similarly to the house at 1 Asnyka street, this one was also intended as a tenement house for the employees of the PZL Aircraft Engine Plant No.2. The investor was Michał Kraus, Ignacy Kraus’s brother. Both corner axes of the façade feature recessed loggias, whereas the central axis is emphasized with bay windows on the first, second and third floors, all of them clasped on both sides with curved balustrade lines. The bay windows are crowned with a broad terrace on the level of the attic. Such Modernist tenement houses offered top-quality flats, in terms of the usable area and the fittings. Also, they were among the first houses in Rzeszów to use a reinforced concrete structure. Now, it is worth seeing the Fryderyk Chopin Provincial Specialist Hospital at 2 Szopena street. To reach it, we go along 3 Maja and Słowackiego streets, then turn into Słowackiego street, and then go straight on, along Zamenhofa street. Finally, we take Naruszewicza street, which leads towards the hospital. Its construction was started in 1939, according to the design by Jan Semkowicz, an architect in Lwów (today’s Lviv). Sadly, the outbreak of World War II interrupted the construction work, which was completed only in the post-war years. Three parts may be distinguished in the contour of the building: two wings, each housing a hospital ward, and a corner stairwell, which connected them. In the following years, the hospital was expanded by adding further wings. Hence, its original form has not survived. 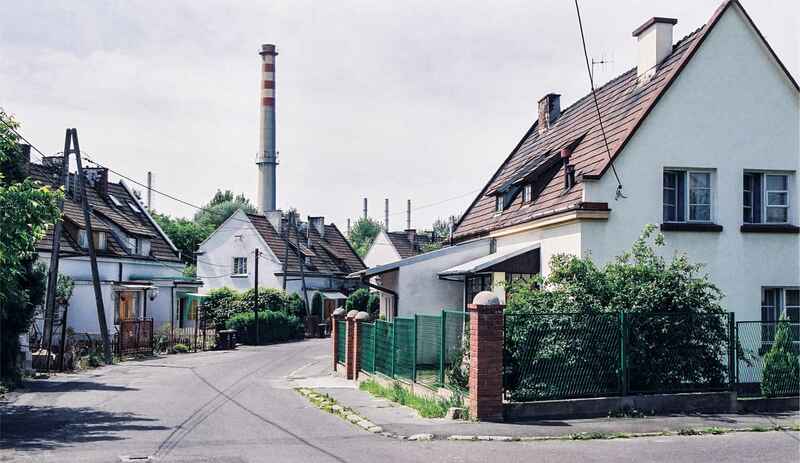 Further buildings whose origins go back to the Central Industrial Region are the residential buildings of the H. Cegielski Machine Tool Plant and the PZL plant. We either take a bus (to get to the Hetmańska / W. Pola 06 bust stop) or go on foot (1.5 km – during the 19 minutes’ walk we can see the edifice of the Philharmonic Hall and the castle of the Lubomirski family), along Szopena street, to Śreniawitów square, and then turn into Hetmańska street. 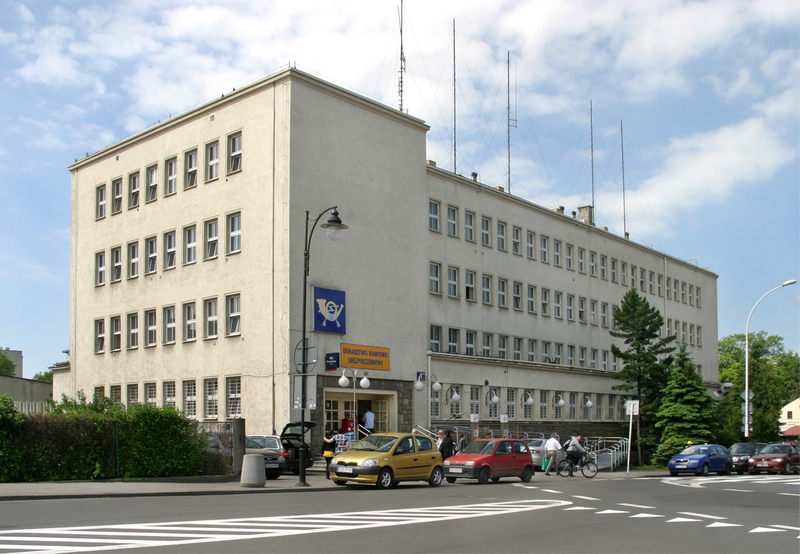 At the corner of Hetmańska and Czackiego streets, we will see the austere Functionalist shape of the former Outpatient Clinic at the Social Insurance Office. Today, this is a part of the Specialist Outpatient Clinic No.1. After 500 metres, we finally arrive at 43 Hetmańska street. There, two blocks of flats built for the workers at the H. Cegielski plant are situated parallel to each other, along the north-south axis, so as to ensure appropriate exposure of the interiors to daylight. Between them, public green amenities were planned, to be complemented with a local shop, the construction of which was prevented by the outbreak of the war. The blocks offered 144 two-room flats. They comprised a living room, a kitchen, a toilet and a small hall with a storeroom. Their design conformed to the standards of the Worker Housing Estate Society, which advocated the optimal usable area of 31 m2 or 36 m2. Each of the buildings had six stairwells, giving access to two flats of each type on every storey. The usable area of the flat depended on the location of the entrances to the buildings, which resulted in different areas of the halls. In the attics, there were drying rooms and shared bathrooms, separate for each of the stairwells. The basements were used for storage rooms, as well as shelters. The architectural style of the worker housing estate of the H. Cegielski plant was similar to that of PZL plant. The stairwells were emphasized by moving them back relative to the façade, the base course of the blocks was faced with clinker tiles. The façades were crowned with the subtle line of the cornice, small attic windows and the slender chimneys, placed at right angles to the roof ridge. The work on these three-storey blocks of flats was entrusted to the Polański & Zakrzewski company in Kraków. The contract between the Worker Housing Estate Society and the municipal authorities required that jobless people should be employed as builders, and the raw materials should be bought from Polish companies. The sand and the hollow bricks were delivered by Salomon Fiber’s and Zenon Augemann’s companies. The former also provided the room stoves. According to the design, the buildings were to be supplied with gas. In January 1939, the construction of one more building was considered. In lieu of money, the town of Rzeszów transferred the title to some municipal plots of land, worth about 50,000 zlotys, to the developer. However, the construction never began. After World War II, both existing blocks were raised by two further storeys, given vestibules at the entrances, as well as better thermal insulation – but the additions have not changed the original form of the buildings, which have retained their austere character. Now, we move on from Hetmańska street to the intersection with Powstańców Warszawy street. We go through the campus of the Rzeszów University of Technology and then arrive at Poznańska street, where we can see the foreman housing estate of the H. Cegielski Machine Tool Plant. The concept behind the foreman housing estate was developed by Kazimierz Dziewoński. The design was ready in October 1937, and in December the construction of the first 20 two-family houses for workers was given the green light by the mayor of Rzeszów. As many as 124 semi-detached houses had been planned. Moreover, the Regional Planning Office in the Lwów (today’s Lviv) district indicated the need for earmarking enough land for the prospective construction of 9 blocks of flats. The plan envisaged a centrally located primary school building, with urban green areas available to the public. The school building was also given a distinctive, 15-metre-wide walking alley. The centre of gravity of the whole complex was also determined by multi-residential buildings, whose entrances faced one another. An interesting solution were the small squares, inspired by the so-called American “neighbourhood units”. The design of the whole residential estate was a very coherent composition, and the buildings to be constructed were prestigious in character. Until World War II broke out on 1st September 1939, only the first part of the plan had been implemented. After the war, the development continued not in line with the original plans. The Central Industrial Region houses in Poznańska street were built in observance of the Worker Housing Estate Society standards, in the style typical of semi-detached development. They offered a usable area of either 52 m2 or 60 m2, as well as some space for small back gardens. The houses shared a distinctive motif – an open porch with little columns, which gave them a characteristic neat form, reminiscent of the Polish traditional country houses or peasant cottages. The houses are still lived in, though consecutive owners have introduced many changes. From Poznańska street, we move on to Dąbrowskiego street, to see the housing estate of the PZL Aircraft Engine Plant No.2, constructed within the framework of the CIR project. Located at today’s Marii Skłodowskiej-Curie and Bohaterów Westerplatte streets, these blocks of flats were meant to accommodate the growing number of the plant workers. The talks between the owners of the plant and the authorities of Rzeszów on subsidizing the extension of the plant brought no results, due to the lack of finance. Still, the Town Hall welcomed the plan to build a working-class housing estate at Dąbrowskiego street, in the south of Rzeszów. Even in its early days, the factory employed about a thousand people, so providing them with living quarters was an urgent matter. The plan envisaged 17 blocks of flats. Located about 1.5 km away from the plant, between the Rzeszów–Jasło railway line and the road leading in the same direction, the estate covered an area of 18,000 m2. The blocks were situated along the north-west–south-east axis, so as to ensure appropriate exposure of the interiors to daylight. The design of the estate included a centrally located public green area. Between the blocks of flats, there were patches of greenery, with benches and hanging frames. In the very heart of the estate, a fountain was placed, which – being its central point – emphasized the concentric layout of the whole complex. To the north-west, a location for a sports stadium was outlined, whereas a kindergarten with a playground, tennis courts, a community centre and company directors’ residences were built to the north-east. The several-storey-high blocks of flats were designed according to the guidelines of the Construction Department at the Ministry of Military Affairs. Similar architectural solutions were applied during the construction of the residential estate of the PZL Aviation Plant in Mielec, based on the designs by Maj. Piotr Czyżewski, engineer and architect, and Wacław Zouzal, architect. The three-storey buildings were fitted with shelters in the basements and laundries and drying rooms in the attics. There were three types of buildings. Four blocks of flats for workers (today: 3, 5, 7 and 9 Bohaterów Westerplatte street) were built by the Dźwigar company, based in Gdynia, which was also in charge of the construction of the foremen’s block (currently: 1 Bohaterów Westerplatte street). There were also blocks of flats for office workers and engineers (today: 2, 4, 6 and 8 Skłodowskiej-Curie street), as well as the director’s and deputy directors’ houses. The work began in the autumn of 1937. Until the war broke out in 1939, ten blocks of flats and two single-family houses had been built. 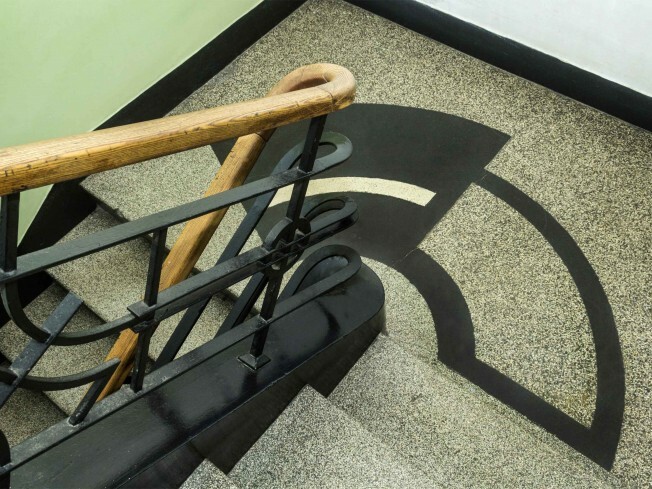 Apart from the differences in the layout of the whole urban complex, a motif which differentiated the estate in Rzeszów from the similar one in Mielec was the round-cornered small recesses in the several-storey-high stairwell windows. The residential blocks built at the time of the Central Industrial Region are still lived in, and the subsequent renovation works have not changed them significantly. 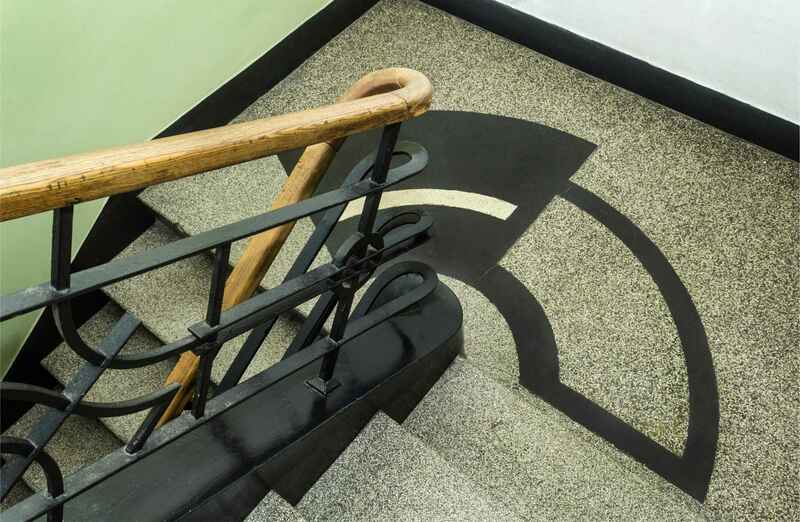 The surviving stairwell flooring, featuring geometric ornaments, and the characteristic metal balustrades with rounded wooden handrails have retained the feel of those times. The director’s house (today: 4 Romana Niedzielskiego street) and that of the deputy directors (today: 2 Romana Niedzielskiego street) were designed in observance of the then fashion for subdividing flats into a day and a night sections. The ground floor was the daytime section, with the evening- and night-time rooms upstairs. The residences were designed with great attention to details, such as oval lights or dynamically shaped balustrades. Since the post-war transformations have substantially changed the contours of the residences, they are far from the original design today. Although these working-class housing estates have not been fully completed, they are the first examples of the modern social housing in Rzeszów, aimed at offering each inhabitant access to fresh air, light, heat, greenery, as well as peace and quiet. Thus, the above-described designs strove to ensure optimal exposure to daylight, air circulation, as well as road and walkway arrangement. Residential estates for workers were also meant to facilitate the inhabitants’ personal development by granting them free access to the educational and recreational infrastructure, as well as service outlets. Opposite the housing estate of the PZL Aircraft Engine Plant, at 87 Dąbrowskiego street, is the hotel built by Baron Stefan de Ropp of Poznań for the PZL plant employees. Its interesting silhouette, with a strikingly expressive corner, was designed by the architect Zygmunt Tarasin. At this point, we can finish our walk along the Route. The best way to return to the railway or bus stations is to get on a bus headed for the centre of the town (for Piłsudskiego street). However, avid walkers may choose to cover that distance (5 km, about 60 min.) on foot. To reach the town centre, they can take Dąbrowskiego or Hetmańska streets, or walk along the River Wisłok. The other locations related to the history of the CIR include the entry gate of the former PZL Aircraft Engine Plant (since 1st July, 2015: Pratt & Whitney) at 120a Hetmańska street, and the monument to the history of the PZL WSK, erected near the dam on the River Wisłok. The construction of the PZL Aircraft Engine Plant No.2 in Rzeszów, covering an area of 10.8 hectares, began in the spring of 1937. Although the PZL plant was a privately-owned company, it was the Ministry of Military Affairs that was in charge of the construction. The design by the architect Piotr Czyżewski was endorsed by Maj. Adam Mrówka. The design envisaged a mechanical and thermal processing facility, an assembly shop, a tool shop, the main warehouse, a woodworking shop, an engine test house, a boiler house, a cold store, a utility warehouse and a fire brigade building, as well as a management building, a canteen, a porter’s lodge and a company school. The plant was laid out along three longitudinal axes. The gate building, the management building, the mechanical and thermal processing facility (nearly 200 m2) and, finally, the assembly shop (with a railway line behind it) were located along the central axis. All these facilities were surrounded by the remaining buildings. The premises of the plant were walled off the nearby green areas and the Lisia Góra Mountain park. The multi-section plant halls were given a monolithic reinforced concrete frame structure, filled with brick. Their window openings, made of reinforced concrete too, were vertically oriented, which was dictated not only by the practical considerations of air-tightness and cleanliness, but also by anti-aircraft defence regulations. Although their designs emphasized architectural functionality, the buildings did not lack neat finish, modern looks or elegance. Symmetry was important, as well as additional decorative details. Worth noticing is the impressive form of the two-floor management building, where the main entrance was placed in the elevated central section of a course of alternate pilasters and vertical windows. This compositional dominant was placed against the background of regular groups of windows, joined by the lines of the cornice. The flanking stairwells featured pilasters too, which added variety to the tall building of the main production hall, which had another floor on top. Instead of pilasters, the remaining buildings were given hardly noticeable flat lesenes. Thus, vertical architectural elements have become the common aesthetic motif of the plant buildings. The buildings were very functional, with large windows intersected by vertical or crisscrossing muntins. Additionally, vertical skylights were also placed in raised sections of the flat roofs. The main gate building, leading to the plant, was given a unique avant-garde appearance, in the form of symmetrically placed twin motifs surrounding the gateway. Another distinctive solution was the rounded corner, with an arcade leading from it, as well as the short colonnade courses supporting the roof over the entrance. Other architectural motifs included varied-sized windows, or the bull’s eye windows in the gable wall. Also, moving the chimney shafts outside the building has made it possible to give a sculptural feel to the silhouettes of the buildings. The construction work itself was a challenge, due to the limited supplies of good quality tar paper, pitch, or even axes or shovels. Despite that, the plant was ready in the autumn of 1938, with about 2,000 people in its employ. Its first director was Henryk Porejka, a former employee of the Airframe Plant No. 1 in Warsaw. The other management members were brought from the capital city too. The construction of the plant had been supervised by the counter-espionage officers of the 2nd Department of the General Staff of the Polish Army, so practically the whole technical documentation of the plant was destroyed in the early days of World War II. From the plant gate, we head for Żeglarska street, and then to the promenade along the Wisłok. Not far from the dam on the river, we can see the restored sculpture entitled “The Flight”. It was created in 1976 by Professor Stefan Borzęcki’s students at the Academy of Fine Arts in Cracow, at the initiative of the WSK plant (today: Pratt & Whitney). For years, the sculpture had embellished the square at Powstańców Warszawy and Hetmańska streets. Then, it was relocated to the premises of WSK. After it had been restored, it was moved again, in 2015, to the riverside promenade. During the unveiling ceremony, 77 trees were planted in its new location to celebrate 77 years of the activities of WSK in Rzeszów.